So I have put off writing this post for a while as I knew it would be an emotional one to face! Life can be so tough, heartbreaking and unfair, no family knows this more than mine! 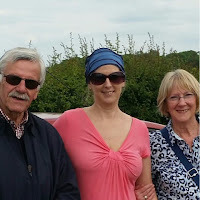 Previously my mum had survived two incidents of breast cancer, my Dad a triple heart bypass and my father-in-law had passed away from stomach cancer. We were again reminded of this when our family endured even more distressing health scares! On top of my Leukaemia diagnosis and the brutal treatment my family had to witness me enduring my Dad suffered an abdominal aortic aneurysm or AAA! This is extremely dangerous, in fact his consultant has subsequently told us that he only had a 20% chance of survival and the aneurysm was the largest he’d ever dealt with! The surgeon had never seen anything like it and was amazed and delighted at Dad’s recovery. On the day it happened Mum and Dad were just getting in the car to come and visit me when he’d suffered acute pain in his abdomen so he went back into the house to sit down thinking it would pass. Soon after this he collapsed, Mum had to dial 999 and is still quite traumatised by what happened next. It was not long before a first responder arrived and started life saving treatment on their lounge floor. Initially, due to my Dad’s previous heart condition, they thought it was a heart attack and Mum was asked to assist by holding the fluid they were pushing into him as his BP was very low. The ambulance arrived shortly after this and they did an ECG which indicated that it wasn’t his heart but a suspected AAA! They stopped the fluids and immediately took him in the ambulance to the nearest A&E in Grimsby where they did an emergency CT scan confirming the AAA. The A&E doctor told my family that it was life threatening and he might not make it to the nearest vascular unit which was in Hull. He was rapidly transferred to Hull Royal Infirmary where a vascular surgical team were ready and waiting. During the journey the ambulance crew were in constant contact with the team, Mum was told they didn’t know if they would make it in time. When they arrived Dad was rushed straight into theatre and was operated on for 4 hours; after an extremely anxious wait my family was informed that he’d pulled through despite the condition he’d arrived in! He spent 3 days in intensive care and a further two weeks in hospital. This is another example of how lucky we are to have the NHS and how amazing it is…this all happened on a Sunday! The whole system worked fantastically from the first responder, ambulance crew, A&E team and radiology department in Grimsby to the surgical team on standby in Hull! Dad had excellent care by the vascular unit in Hull and as a family we are so grateful! All the time this was going on I was oblivious in hospital; my family had decided not to tell me straight away. I remember feeling annoyed as I was waiting for Mum and Dad to arrive for their visit! For me visitors were extremely important, they really helped keep my spirits up which at times were pretty low. Lee had to sit by my bedside reading updates via text without me knowing all the time worried out of his mind! He told me later that day once they knew Dad would pull through! I was in shock and couldn’t comprehend losing my Dad or that this could be happening, I tried to keep calm prayed we wouldn’t be so unlucky. Then suddenly all I wanted to do was get out of hospital so I could be with my Dad but…it wasn’t that easy. I was still neutropenic and even under these circumstances my consultants wouldn’t put my health at risk. My family were torn between two hospitals having to split their time between Lincoln hospital and Hull Royal Infirmary, it was tough and they were past breaking point (these hospitals are not close to each other)! Once I was well enough to be discharged and I was at home I sat and cried, so weak, ill and too scared to visit Dad. However, after a few days I talked myself into going over to Hull with my Mum and Sister. Even though I was so pleased to see Dad I spent the whole time feeling overwhelmingly anxious with a feeling of dread hanging over me. I still had more ghastly treatment to go through and what had happened to Dad had really shaken me. I know it meant a lot to Dad that I made it over to the hospital and I’m certainly glad I went as it was something I could do to support him and my family after they’d been at my bedside so much. For once I wasn’t the patient in the bed!! Dad has always had such an amazingly positive attitude and even after this he said “someone is smiling down on us because I survived and you are going to be ok.” I thought ‘are you kidding?’ but, he has a point! Our Family also had another cancer scare involving my nephew and at the time I was worried that, as he’d seen what I was going through, he would be really scared. I remember telling him that his treatment wouldn’t be as hard as mine hoping it would help. I knew exactly how terrified he must have been, I’d always tried to keep my fear hidden from the children so hoped he hadn’t seen through me. Once he’d been to his consultant at Nottingham’s Queens Medical Hospital and been given the all clear I remember I cried with relief as I couldn’t bear the thought of him having to go through treatment. I knew how hard it was for me, an adult and to see a child go through it must be absolutely heartbreaking. I really feel for those parents who have or are currently going through this. With Mum and Dad on one of my rare trips outside during my treatment! Next Post Privileged to have such an amazing NHS team! I understand the trauma you have all suffered and as my pat did not survive you have my blessings.